Every time we buy something, we produce trash, not only the packaging and labels etc that come with the product, but also the thing itself. At some point, that will become trash too and will need to be disposed of. Do any of us have any real idea of just how much trash we actually produce, in a day, a week, a month, a year, a lifetime….and what happens to all that trash anyway? Although all that trash is not stored in your home, it is stored somewhere. When we throw something away, it doesn’t just magically disappear, it goes somewhere else. Some of our trash is recycled, right? Right, but it’s important to understand that not everything can be recycled an infinite number of times. Unfortunately, plastic, often the biggest component of our recycling bin, cannot be recycled many times and eventually does end up in landfill in some form. Also, many of the plastics we use everyday cannot actually be recycled at all. Much of our food packaging for example bears the symbol ‘not currently recyclable’ which is a very polite way of saying, ‘this is going to landfill or the ocean’. So how much trash do we all actually produce? The latest figures from DEFRA (2014) estimate that in the UK we throw away around 413kg of household waste per person, per year. That’s around 5 times the body weight of an average male! If you live until you are 80 years old, you will produce and leave behind the weight of just over four double decker buses worth of rubbish. The American environmental activist Rob Greenfield carried out an experiment recently. 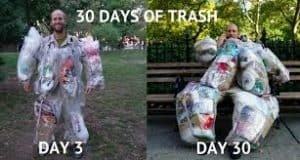 He decided rather than throw away all the trash that he produced over a month, he would wear it instead. Click here for more details of his experiment. The point is that when we throw our trash away, we just forget about it and feel no responsibility towards it. It becomes someone else’s problem – except that it doesn’t. The environmental damage it causes IS our problem. Recycling is important and we need to make sure we recycle everything we possibly can. More importantly though, is the need to actively reduce the amount of trash we produce. We simply need to create less waste because once it’s been produced, it’s never gone ‘away’. None of our waste ever disappears into thin air. Start with today’s ‘Trashless Tuesday’ challenge. Make a concerted effort to see how little trash you can accumulate today. Tomorrow, maybe you can carry on by refusing unnecessary packaging, leaflets, plastic bags, straws, napkins…the list goes on. Thanks for reminding us that there’s no such place as away. it’s such an important thing to keep in mind. Love Rob’s work!